Temperatures have dipped across north India, since the last four days, when Delhi saw the coldest February in four years last Thursday. For all who are planning to put away their winter wear, here is an alert from the Meteorological department, which says expect rain and chilly winds for the next 48 hours. Himachal Pradesh received heavy snowfall overnight; localities in upper Shimla were cut off as deep snow piled on the roads. 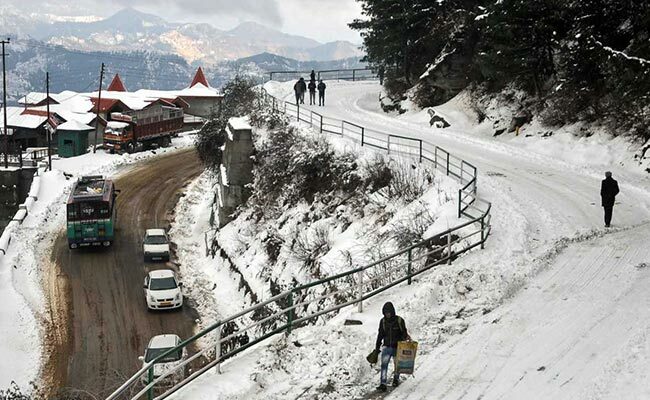 This was the season's second significant snowfall that froze Shimla, a Met department official said. As news of the snowfall spread, tourists started pouring in at Kufri, Mashobra and Narkanda. Hills overlooking Manali, like Gulaba, Solang and Kothi have been getting snow through the day; Shimla recorded a minimum temperature of 1.1 degrees Celsius, while it was minus one degree at Kalpa in Kinnaur district. The local Met office in Shimla said, a storm system that originated in the Mediterranean-Caspian Sea region, is moving across Afghanistan and Pakistan eastwards, and that is expected to bring more rain and snow. Breaking the nearly two-month dry spell, Jammu and Kashmir received heavy rain and snow and this is likely to continue till Tuesday, said the weather office. The strategic Jammu-Srinagar Highway was closed due to heavy snowfall in Banihal area. Authorities have set up helpline numbers for people in the Valley. The minimum temperature was zero in Srinagar while it was minus 0.1 degrees Celsius in Pahalgam and minus 4.6 degrees Celsius in Gulmarg. Kargil town is the coldest at minus 14 followed by Leh at minus 11 degrees Celsius.